Home » Ford Fusion » What’s New on the 2019 Ford Fusion? Have you heard? The 2019 Ford Fusion is finally here! That’s right, the widely-popular Ford sedan is back and better than ever for 2019! But, what’s different about the 2019 Ford Fusion? What’s new? We’ve got the answer to that and more, right here! 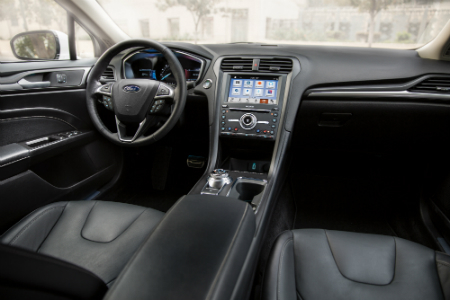 The 2019 Ford Fusion received numerous changes and modifications for the 2019 model year, but the big headline is that it’s the first Ford model with standard Ford Co-Pilot360! The Ford Co-Pilot360 is Ford’s new advanced suite of standard driver-assist technologies that is more comprehensive than any other full-line brand in North America! But, that’s not all! On top of the Ford Co-Pilot360, the 2019 Ford Fusion also offers Enhanced Active Park Assist! Parallel parking has never been easier than in the 2019 Ford Fusion! Does the 2019 Ford Fusion Have All-Wheel Drive? It used to be that All-Wheel Drive (AWD) systems were saved for large SUVs, crossovers and even trucks, but not cars. Not anymore! More and more sedans are offering drivers better traction with an AWD system. But, what about the 2019 Ford Fusion? Yes! The 2019 Ford Fusion offers drivers the innovative Intelligent AWD! This system uses sensors to balance torque between the front and rear wheels for maximum handling and traction! It’s so good, most of the time you won’t even notice it’s working! Want to learn more about the 2019 Ford Fusion? Ready to get behind the wheel of one? Contact our staff at Metro Ford Sales & Service for more information or to schedule a test drive today! This entry was posted on Tuesday, October 2nd, 2018 at 9:28 am	and is filed under Ford Fusion. You can follow any responses to this entry through the RSS 2.0 feed. You can skip to the end and leave a response. Pinging is currently not allowed.